It’s the cruelest way to lose a football match but getting beat in a penalty shoot out is exactly what happened to the Vietnamese women’s team in their match against Chinese Taipei last night. It takes guts and courage to step up and take a spot-kick when a match can’t be decided, and after 120 grueling minutes in the Indonesia heat during this quarter-final clash, the tired legs were clear to see. 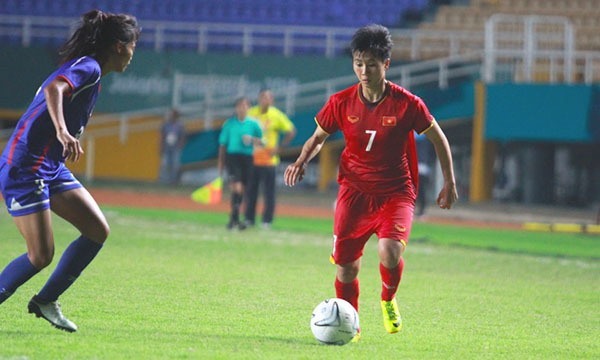 Phạm Hoàng Quỳnh and Thái Thị Thảo had ran their hearts out for the class with Tapei, but in the end both players failed from 12 yards. Quỳnh saw her effort saved by the Taipei number one while Thảo’s penalty hit the cross bar. While the men’s team progressed into the next round, sadly for the women it means its time to head home from the Asian Games (ASIAD). For 90 minutes of this clash in Indonesia’s South Sumatra, there was nothing between the two teams. Both seemed anxious to commit to bodies in the box and chances were few and far between. Just before the half hour mark there was an opportunity for Việt Nam to break the deadlock when they were awarded a free kick on the edge box. In a routine clearly rehearsed on the training ground, Nguyễn Thị Tuyết Dung curled a clever left-footed effort from 20 metres around the defensive wall that looked destined for the top corner. But Taipei goalkeeper Tsai Ming-jung had other ideas and diving to her right pulled off a world class finger tipped save to deny Việt Nam the opening goal. That was the best chance of the first half for Việt Nam and it was midway through the second half Ming-jung was called into action again to deny Dung once more. After the Vietnamese number 7 had charged down the ball midway in the opposition half, she left fly with that sweet left foot this time low into the corner forcing yet another great save from Ming-jung. If Việt Nam were to break the deadlock it would surely have come from the feet of their classy attacking midfielder. After Taipei failed to clear their lines on 80 minutes the ball fell kindly to Dung who’s sweet strike was once again saved by the opposition number one. As the final whistle loomed, both teams were clearly shattered and the game fizzled out during extra time and chances were limited. From the penalty spot Dung stepped up to take the first spot kick and converted comfortably, finally managing to find the net against Ming-jung who had been her nemeses in open play. Chương Thị Kiều scored the second despite Ming-jung getting a hand to the ball diving to her left. But those to goals were not enough for the team in red to progress and their ASIAD dreams is over.